Why Are We So Shocked When Moms Drive Drunk? Women's drunk driving arrests are rising, but Daniel Schuler, husband of the woman who killed herself and seven others by driving the wrong way on the Taconic State Parkway with a BAC of 0.19, says drinking didn't cause her crash. According to the AP, arrests of women for driving under the influence of alcohol or drug rose 28.8% between 1998 and 2007. In that time, men's arrests fell by 7.5%. As of 2007, women got 18% of DUIs. They are drinking more, too — the number of women having four or more drinks a day rose from 1.5% 2.6% between 1992 and 2002, and doubled in women between the ages of 30 and 44. Some say these increases are caused by the pressures of the recession, in which women bear an increased responsibility for bringing in money while still taking care of their homes and children. Clinical psychologist Carol Goldman said, "because of that, they have a bigger burden then most men do. We have to look at the pressures on women these days. They have to be the supermom." He cites a tooth abscess, a previous case of gestational diabetes, and a lump in her leg that "kept moving" as possible causes for the crash. He also denies that they were having problems in their marriage, contradicting a "bar friend" the New York Post identifies only as "Sheila," who supposedly said Diane Schuler's "marriage seemed a bit rocky, and I think she felt trapped by it . . . for the last couple of months. She didn't appear to be a happy person." Though we don't know all the facts — and the Schuler family is considering exhuming Diane's body to conduct an independent autopsy — Daniel Schuler's claim that a tooth abscess rather than 10 shots of vodka caused his wife's crash seems like denial. It can be difficult for family and friends to admit when someone has an addiction problem, but the difficulty is compounded in the Schulers' case by a greater one: the shock of a mother causing harm to her children (her son Bryan was also in the car, and is recovering). The AP's coverage of women's drunk driving is permeated with this shock. Mothers Against Drunk Driving CEO Chuck Hurley says, "Women are picking up some of the dangerously bad habits of men." And there's a hint of moral outrage in the assertion of Tom Meier, director of Drug Prevention and Stop DWI for Westchester County, that "we realized for the last two to three years, the pattern of more female drivers, particularly mothers with kids in their cars, getting arrested for drunk driving." He offers no numbers to back this up, but the AP tells us of a woman arrested after clubbing with her teenager, and another whose children let her car in fear at her drunkenness. 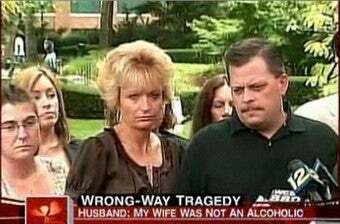 Alcoholism is an old story, but the AP implies that this is new: these are women, these are moms. 39 years ago, on the day my dad told my mom that he was leaving us for another women, she drove the car head-one [sic] into a tree. I was in the front seat and my two sisters were in the back. It was a biga$$ car so luckly none of us were seriously injured. I took the worst of it, cracked skull and broken arm from smashing into the dash board. And yes I had my seat belt on. Back then we only had lap belts... no shoulder harnesses. She said she couldn't see because of the tears in her eyes. But I could see her and she wasn't crying. She was just really really mad. Schuler's actions were irresponsible, and they had terrible, tragic consequences. But do we need to brand her as a woman scorned? Do we need to subject her remaining family to our double outrage, for the crimes not only of driving under the influence but of being a bad mom? Of course, Diane Schuler bears the blame for the deaths of the children in her care. But by heaping extra shock on the situation because she was a woman and a mother, we only perpetuate the stereotype that there is a single kind of person who is an alcoholic. And we make it harder for men like Daniel Schuler to see the warning signs in people they love.